Black Sabbath: Paranoid is the latest installment of the fine Classic Albums documentary series, which spotlights on the story behind a classic rock album. And certainly Paranoid is a worthy subject for discussion being that it remains one of the most–if not the–influential heavy metal albums of all time. Featuring recent interviews with the original members of Sabbath–Ozzy Osbourne, Tony Iommi, Geezer Butler and Bill Ward–and associates, journalists and admirers (among them Black Flag’s Henry Rollins), the documentary focuses on the making of the album and the stories behind the songs. 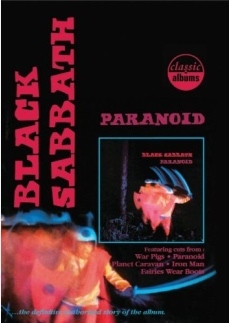 Given the reputation of Sabbath as purveyors of stoner metal and the dark arts, it’s sometimes easy to forget the message of Paranoid, part of which is a provocative protest against the Vietnam war (“War Pigs”) and drugs (“Hand of Doom”). And underneath the slabs of thunderous metal (“Paranoid”) reveal a quieter side of the band, as in the case of the trippy ballad “Planet Caravan.” It puts into perspective how outsider this band was compared to their contemporaries, which probably explains why Sabbath is legendary. As the album turns 40 this year, this excellent documentary gives the appreciation and due that Paranoid deserves–of course, Sabbath’s loyal fan and supporters already knew this.